Wonder Woman is by far the most satisfying of the DCEU film series to date. By the end of the movie the thought passed through my mind that if Zac Snyder had given Superman a similar optimism (he's credited as both a Producer and co-writer on Wonder Woman), that character would be in a better place now. That isn't a totally surprising thought as director, Patty Jenkins, has not only stated that her Wonder Woman takes some inspiration from Richard Donner's 1978 Superman movie but also Superman is a character she'd like to make a film about too. As much as I'd like to see Patty's version of Superman, here's hoping she will stick around to complete Wonder Woman 2, now that she isn't tied to an origin story and can set any subsequent movie within the modern day DCEU. All that aside, if you're a fan of Gal Godot's Wonder Woman from Batman v Superman, this movie will certainly cement that fandom by clearly defining exactly how awesome the live action version of the character can be. If you haven't seen Batman v Superman then you may not get as much out of the modern day book ends of the film as you might have but it won't affect your enjoyment or ability to understand the plot. The main story is completely self contained, following the origin of the character along with her first foray into World War One ravaged 'Man's World' after leaving the protected sanctum of her home island of Themyscira. The set up to the final confrontation is clearly spelled out in the first act but the journey to that confrontation is less obvious and will keep you guessing as to how that might play out. Going into this movie I was initially concerned that the naive, new to the outside world, version of Wonder Woman might not be quite as exciting or capable as the modern day, self assured version but it was barely an issue. Gal's Wonder Woman (and Diana Prince) carries herself with such confidence that she is never disadvantaged or weighed down by her inexperience of the outside world. At the same time she never comes across as being arrogant or so naive to the point of silliness. For the most part Wonder Woman comes across as extremely capable even in unfamiliar situations. Gal's Wonder Woman doesn't waste time with words, she just gets things done... and it's amazing to witness. Chris Pine's Steve Trevor is equally capable, if a little more cautious (understandably). There's clearly a chemistry between him and Diana but, more interestingly, it's his attempts to manage and contain Diana's confidence of purpose that gives the film its humor. I would've liked to have spent more time with Diana Prince because I enjoyed the scenes between her, Etta Candy, Steve's Secretary, played by Lucy Davis, and Steve when all three were in scenes together. The action scenes of this movie are as good as any I've seen in a DCEU movie. The bigger fights clearly are heavily reliant on CGI (that was a little less seamless in places than you'd hope) but overall great to watch. Particularly Wonder Woman's major fight scenes that, I feel, make Batman's warehouse fight in Batman v Superman look positively ordinary on the awesomness scale. Gal Godot completely sells her character as both Diana and Wonder Woman despite people's concerns that she seemed too skinny to be an Amazon Warrior. Why people think Wonder Woman needs to be a muscle bound hulk of a woman is beyond me. There are Amazon Warriors in this film who are just that if you want a hint at what that kind of Wonder Woman might have been like. Gal never feels weak in her battle scenes because she exudes confidence at all times. As she begins to discover her powers it's clear her physical strength is not entirely on the same level as the average Amazon warrior. Overall, Wonder Woman is a solid entry into the DCEU. I wouldn't say it's a perfect Superhero movie but it succeeds greatly because the film's creators have really understood the title character as a positive force for change. As I said at the beginning of this review, a similar treatment for Superman could go along way in restoring that character's place as an iconic hero worthy of standing along side Wonder Woman. 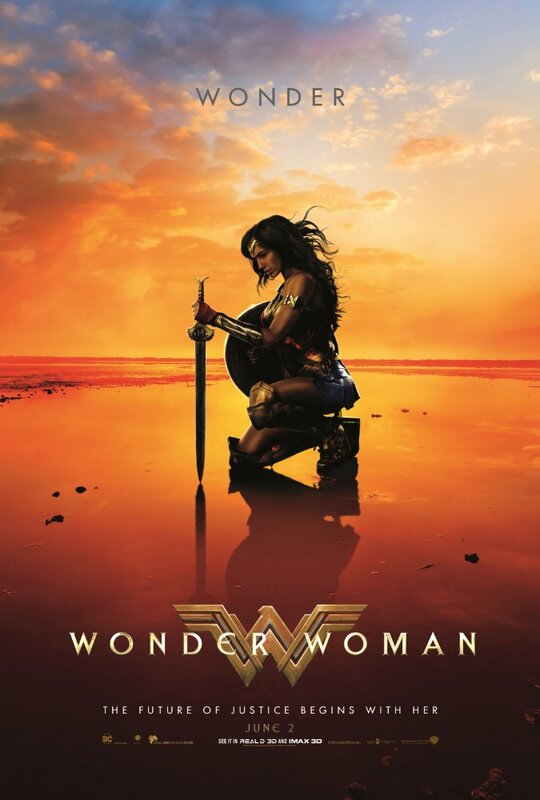 Based on what I saw in this film at least, Wonder Woman could probably slap some sense into cynical, emo, "why do I even bother", Superman and not even break a sweat. I enjoyed this movie and, if you're a fan of the character, there's no reason why you shouldn't too.